On November 30, Interior Design’s 33rd annual Hall of Fame awards lit up the I.M. Pei–designed River Pavilion at the Jacob K. Javits Convention Center, the event’s new home after more than three decades at the Waldorf Astoria. Editor in chief Cindy Allen kicked off the event with a unifying message before inducting the 2017 honorees. The ceremony honored five unique individuals who have made significant impacts in workplace, hospitality, retail, and residential design, and whose leadership and ingenuity will have lasting effects on the industry. The 2017 inductees are Robin Klehr Avia (Leadership), Peter Q. Bohlin (Architecture), Lidewij Edelkoort (Influence), and Mark Zeff (Design). In honor of his centennial, the venerated architect I.M. Pei was also given a special tribute during the ceremony, which was hosted in a building of his design. The River Pavilion hosted 1,200 designers, architects, and other industry professionals dressed to the nines in Pei’s famed glass superstructure, recently renovated and expanded by FXFOWLE Architects. 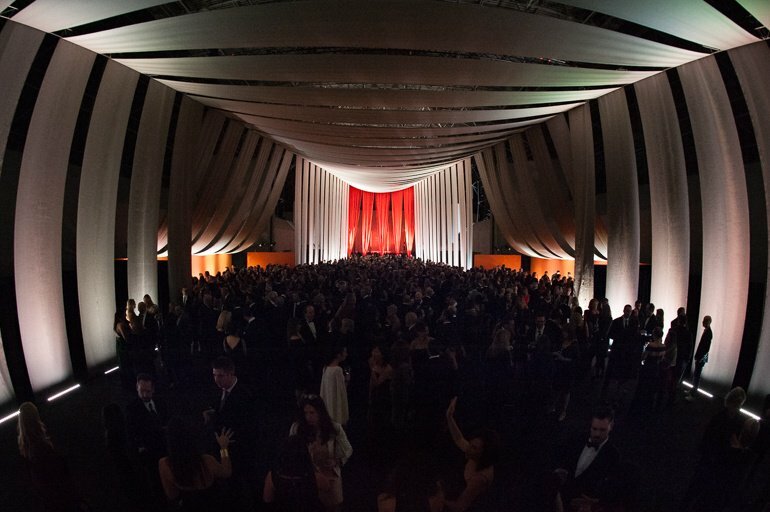 In addition to the new venue, the Hall presented by Sunbrella and Sunbrella Contract gave the gala a feeling of glamour and dynamism that set the tone for the rest of the evening. The impressive entrance experience, designed by Tsao & McKown, played with perceptions through strategically draped Sunbrella performance fabric and braid. The corridor expanded and contracted, drawing focus to the final destination banquet hall: a space to honor the most exceptional design in the industry. A very special thanks to our 2017 sponsors for their support of the 33rd Annual HoF Awards.